LONDON -- Conservative lawmakers in Britain will hold a no-confidence vote on Prime Minister Theresa May Wednesday that could see her removed as the leader of her party and the British government. The announcement throws Britain's already rocky path out of the European Union, which it is due to leave in March, into further chaos. If May loses the vote, with at least 148 members of her party casting a vote of no-confidence, she will be the second Conservative prime minister toppled by the tumultuous Brexit process. The first one, David Cameron, resigned after calling the public referendum that led to Britain's decision to pull out of the EU in the first place. Graham Brady, who heads a committee overseeing Conservative leadership contests, said he had received letters from at least 48 lawmakers asking for a vote on Prime Minister May's leadership. As a result, he said, "the threshold of 15 percent of the parliamentary party seeking a vote of confidence in the leader of the Conservative Party has been exceeded." Brady said the vote would be held in Parliament Wednesday evening, with the results announced soon after. If May loses the vote she will very likely resign, which would result in a vote within her Conservative, or Tory Party, to pick a new leader. That person would likely be called upon by Queen Elizabeth II to form a new government and take the reins as the next prime minister. 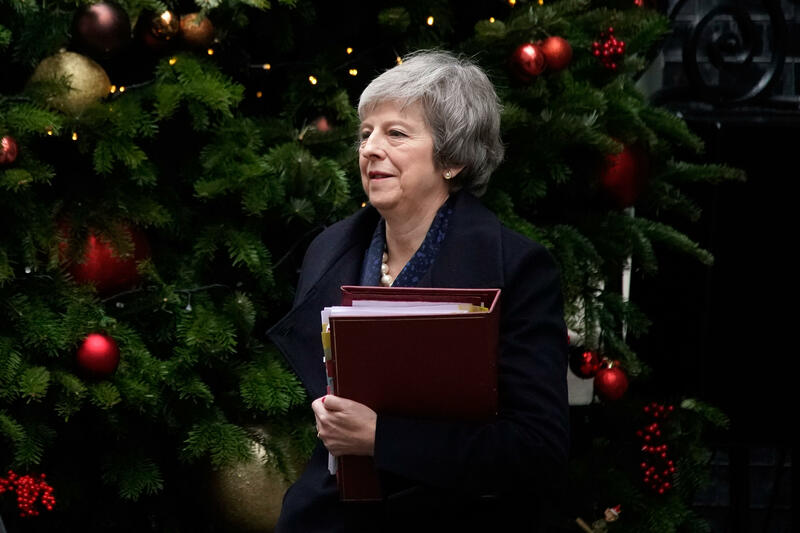 However, May could also opt to hold her position as party leader and prime minister until her successor is chosen -- a process that could drag on for an indeterminate period of time. If she wins the vote -- an outcome which looked increasingly likely as the vote neared -- her Tory foes would be unable to launch another leadership challenge against her for a year. CBS News partner network BBC News projected Wednesday that enough Tories had voiced support for the prime minister to see her survive the evening's vote. Many Tory lawmakers have grown angry with May over her handling of Brexit, and the challenge comes days after she postponed a vote to approve her draft divorce deal with the EU. She delayed that vote because she knew her plan faced all-but-certain defeat. Supporters of Brexit say May's deal fails to deliver on the clean break with the bloc that they want. Pro-Brexit legislators Jacob Rees-Mogg and Steve Baker said in a joint statement that "in the national interest, she must go." The Prime Minister herself emerged from her official residence at 10 Downing Street in London on Wednesday to acknowledge the challenge against her, and vow to "contest that vote with everything I've got." She warned that a change in the nation's leadership at this late stage, with the U.K. set to break up with the EU in less than three months, "will put our country's future at risk" by "delaying or even stopping Brexit when people want us to get on with it." She said she was cancelling a trip to Ireland on Wednesday to remain in London, where she would lobby her Conservative colleagues to back her leadership. She warned them that abandoning her, "risks handing control of Brexit negotiations to opposition leadership in parliament." May's government triggered the "Article 50" mechanism in the European Union charter more than a year and a half ago. That move set in motion the countdown clock to March 29 -- exactly two years after Article 50 was triggered -- at which point Britain will cease to be a member of the EU, with or without a deal agreed between the two parties. Economists, including the British government's own, have warned that such a "no-deal" Brexit could bring a recession, leave Britain's ports and cross-border trade in chaos and many European citizens' immigration status in question.